"Political chart" by Traced by User:Stannered, via Wikimedia Commons. I mentioned in a recent post that I grew up with negative attitudes toward libertarianism because I did not adequately understand it. I'm still learning about it, and I've discovered far more nuance than I realized was there. In this post, I'd like to share how moving beyond the simple right-left dimension has helped me understand the complexity of political orientation and led me to find common ground with many people where I would not have expected to find it. As a child, I thought of political orientation as something that existed along a single right-left dimension. Conservatives could be found on the right of center; liberals could be found on the left of center. It was no more complicated than that because I didn't know any better. As I became a bit more politically aware during late adolescence, I began to recognize that there was more variability along this right-left dimension than I had previously realized. Not all conservatives and not all liberals were the same, and it made far more sense to think about one's relative position along the dimension. Some liberals were much farther out to the left than others; some conservatives were much farther out to the right than others. I discovered that where along the dimension someone landed was more useful in understanding them than applying labels like "liberal" or "conservative." As I moved into adulthood, I realized that the uni-dimensional right-left continuum was too simplistic and that something else was needed to account for the full range of diversity in political ideology. But I still wasn't sure what it was. A big part of the problem is that I had bought into the idea that the right-left dimension was supposed to be sufficient for modeling all the variability that was out there. For example, I thought that socialism could be found to the left of conventional liberalism on the left side of the dimension and that libertarianism could be found to the right of conservatism on the right side of the dimension. This overly simplistic approach limited my understanding of both. It also didn't help when it came to things like neo-conservatism and neo-liberalism, neither of which seemed to be a matter of just moving a bit more to the right or the left along the single dimension. What would eventually help me understand political orientation would be the realization that there was a second dimension and that it could be as important if not more important than the right-left dimension. That dimension, libertarian-authoritarian intersects the right-left dimension and allows us to locate people in space much more accurately with regard to their political orientation. Admittedly, the graph I've used here is still too simplistic. It was one of the only ones I could find that was free to distribute. There are some excellent ones out there, but they are all protected by copyright. 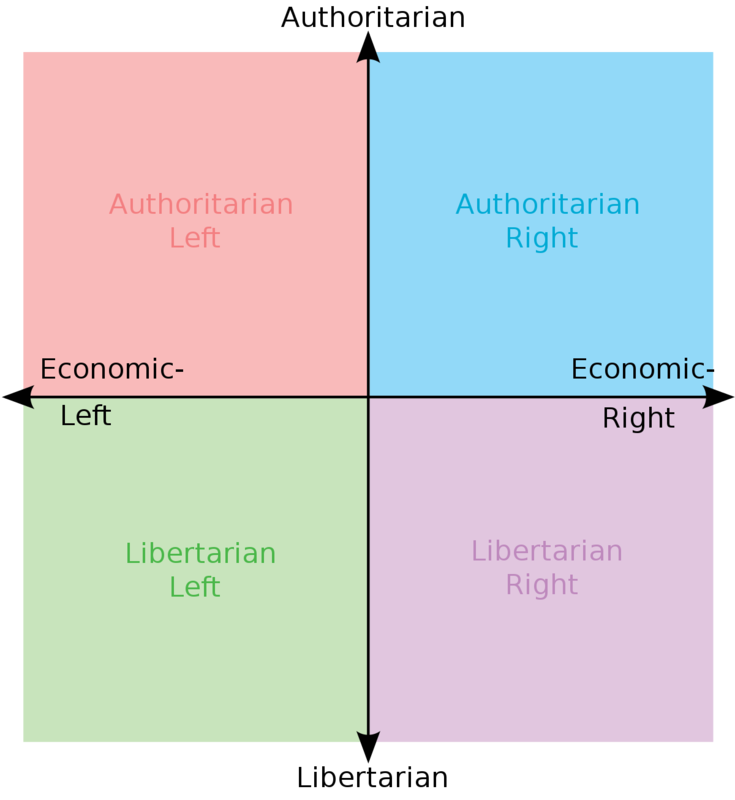 To appreciate the point of having both dimensions, ignore the four quadrant labels (i.e., authoritarian left, authoritarian right, libertarian left, and libertarian right). They are still too simplistic. The point of using both dimensions is that we can locate ourselves and others in space along both dimensions. Not only is one's relative position on the right-left dimension important, but one's position on the authoritarian-libertarian dimension is equally important. And as we see quite clearly, someone can be left leaning and still be strongly libertarian (or authoritarian) just as someone can be right-leaning and strongly authoritarian (or libertarian). When I say that I am to the left of the right-left dimension, this only tells part of the story. I've been to the left for most of my life; however, I have shifted significantly along the authoritarian-libertarian dimension, moving from the authoritarian side to the libertarian side of center. As recently as 10 years ago, you would have found me in the authoritarian left quadrant. I would have been barely on the authoritarian side of the line, but I would have been there. I'm now in the libertarian left quadrant. The addition of the authoritarian-libertarian dimension helps us understand the great variation we find on the left and on the right. One expects to find much of the classic Christian right in the authoritarian right quadrant. The more interested they are in legislating their Christian morality by restricting your rights, the higher on authoritarianism they tend to be. And so when you think of the right-wing Christians who want to make it illegal for you to "sin," this is where you expect to find many of them. And one expects to find many of the modern 4th wave feminists and social justice warriors in the authoritarian left quadrant. The more interested they are in controlling your behavior through the application of power (e.g., expanding "hate speech," banning speech they consider offensive), the higher on authoritarianism we expect them to be. I grew up thinking of libertarianism as a point along the right-left dimension and not as part of an entirely separate dimension. As a result, I never came close to understanding it. I never saw its value because I was convinced that it was nothing more than an extreme right position. I was mistaken. I'm happy to locate myself in the libertarian left quadrant today, and I've found that I often have nearly as much in common with those in the libertarian right quadrant as I do with those in the authoritarian left quadrant. Imagine that! This has been a positive experience where learning more about how political orientation works and about my own orientation has helped me move away from tribalism and polarization. Doing so has allowed me to recognize that I actually have quite a bit in common with many people with who I never expected to find common ground. If you'd like to see where you fall along both the right-left and authoritarian-libertarian dimensions, you can take a brief test here that will show you.